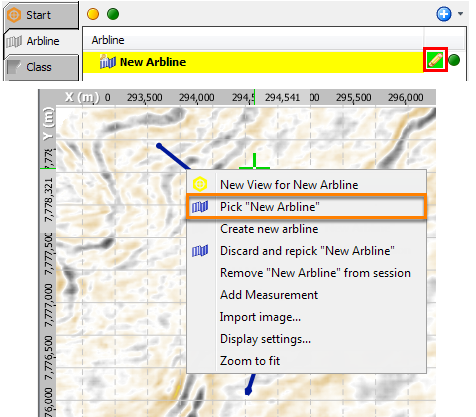 Once created, an arbline can be edited from the Map View or the Points table in an arbline's Details Panel. The arbline will be updated on-the-fly in the Arbline/3D View. 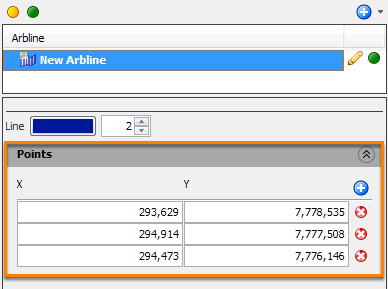 To view volume data along the arbline, see Viewing Data Along Arbline. To edit an existing arbline, first click the Pick arbline pencil icon to enable editing of the arbline. Alternatively, you can right click on the arbline and select Pick "Arbline" from the context menu. Right click on an existing point to delete the point. Click and drag an existing point to move it to another location. Add new points by left-clicking any existing point and placing that point on the map. You will then be allowed to place more points. Move the entire arbline (see Moving an arbline). Changing the coordinates of the points in the Points section of the Details Panel (see Changing coordinates below). Right-click the arbline and select Discard and repick "Arbline" to remove all the current picks and repick the arbline from scratch. To remove the arbline, select Remove "Arbline" from session. To delete an arbline from the project, right click on the arbline in the Details Panel and select Delete from Project. Once you have finished picking, click the Pick arbline pencil icon at the arbline item row to exit the editing mode. Alternatively, double-click or press Esc to exit picking mode. Note: If the arbline is disabled, clicking on the pencil icon will automatically enable it in picking mode. If it is disabled while picking, the arbline will remain visible (but faded) to allow picking, and it will be hidden after completion. Alternatively, you can edit/move the X and Y points for the arbline by manually changing the coordinates in the Points section of the Details Panel. To add a point, click the Add Row icon to add a pair of X and Y points and then define the coordinates. Remove a point on the arbline by clicking the Remove Row icon. Tip: If the table is greyed out and states Points (Locked to Survey), it means the arbline points are snapped to a particular 2D line and cannot be edited. It must be unsnapped before the points can be edited (see 2D Arbline Picking).